Note: Locking Hasp are NOT Sold Separately. 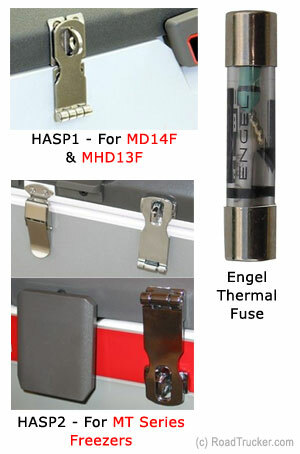 Miscellaneous Engel Accessories: HASP1, HASP2 & Thermal Fuse Engel are all useful accessories offered by Engel for additional security and readiness. HASP1 is designed for 2 smaller units: EMS and 14-Quart (MHD13F and MD14F). 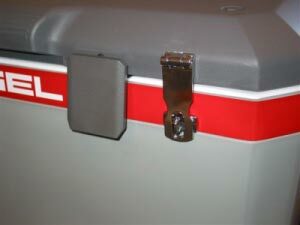 Note: Hasp can ONLY be purchased with the Engel Fridge/Freezer that they will be installed on. NO EXCEPTIONS. 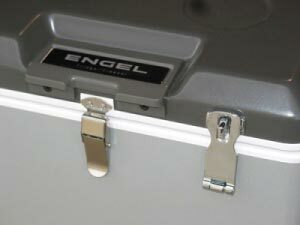 Locking HASP2 is specifically made for Engel MT models (small-large). Note: Hasp can ONLY be purchased with the Engel Fridge/Freezer that they will be installed on. NO EXCEPTIONS. Engel 10 Amp Thermal Fuse is for replacement. This fuse is designed to blow at temperatures above 160°F. Just like a normal fuse, it will also blow if there is a current short circuit or if the polarity is reversed. If your cable is found to have too much resistance, which causes heat, the fuse will blow, thus, protecting your Engel fridge. Engel Thermal Fuse is found in the tip of the DC Cord Plug. Note: If you are in a bind and need a fuse immediately, you can always use a regular 15 Amp fuse in place of the thermal fuse until you can order and receive a Thermal Fuse. The 15 Amp, just needs to be the same size.